April 27, 2002: Wahoo McDaniel's in-ring career is truly legendary. As Tully Blanchard says, "Some guys could draw money in their little area... But Wahoo McDaniel was a star everywhere he went." This is multi-media celebration of the legendary Wahoo McDaniel featuring video clips of Wahoo in action. Listen to interviews with Joe Blanchard, Tully Blanchard, Jack Brisco, Ivan Koloff, and Superstar Billy Graham. Click here for the Wahoo McDaniel Multi-Media Tribute. The Jack Brisco shoot interview in stock now! 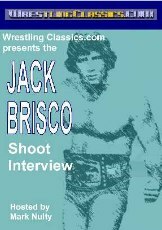 WrestlingClassics.com is proud to announce the release what will become an instant classic and must-have video in the Jack Brisco Shoot Interview! The conspiracy to try and double cross him out of the NWA World heavyweight championship. The story of why he and his brother Jerry sold their shares of Georgia Championship Wrestling to Vince McMahon resulting in the famous Black Saturday for WTBS wrestling fans. The death threats he received afterward. The story of the time he and Billy Robinson nearly crippled each other in a shoot in an Australia hotel. Why he dropped the NWA World title to Giant Baba during a Japanese tour. How he discovered Hulk Hogan and how instrumental he was in other stars' careers. His sudden departure from the wrestling business. WrestlingClassics.com is proud to announce the release of two great videos! Florida Tape 3 This is destined to be one of the most popular videos in our history. These are Arena matches shot on color 16mm film in the early-to-mid 70s and converted to beta video for the highest possible quality. A small sample of matches see Jack Brisco defending the World title against Dory Funk Jr., Lou Thesz against Johnny Valentine, Dusty Rhodes and Buddy Colt against meet Eddie Graham and Paul Jones in a Lights Out match and so much more. Jack Brisco vs. Dory Funk Jr. The greatest feud of the 70s! Three classic encounters in the series of matches that is revered today! 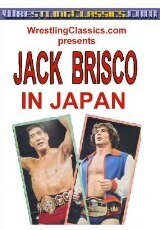 Jack Brisco in Japan Includes the historic Giant Baba victory for the NWA World heavyweight championship. Click here to see the new tapes! Make Money With Your Web site! If you have a Web site, you can join the WrestlingClassics.com Affiliate Program and earn money by promoting our products from your site. Every time you send us a customer from your site, you earn 10% on each sale. No site is too big or too small! Plus, we'll give you $10 just for signing up! It's like having your own Online Store where we do all the work! Click here to learn about the Wrestling Classics Affiliate Program! February 23: The Assassins are universally recognized as one of the greatest tag teams of all time. Jody Hamilton enjoyed success both in the team and later as a singles star. He spoke exclusively on Ringside Live about his legendary run both in the ring and later his time in the World Championship Wrestling office and training center. January 13: The latest edition of This Week In Wrestling is now available to see all of the classic matches, title changes and historic events over the years. January 6: Think you're a wrestling expert? Here's your chance to prove it with the latest edition of the Mystery Wrestler. The winner will receive one of the great tapes from the Wrestling Classics collection. November 18 A main eventer and a champion everywhere he went, Crazy Luke Graham spoke exclusively on Ringside Live. Graham is perhaps best remembered as holding the Los Angeles version of the World heavyweight championship at 25 and being the part of the first WWF tag team championship team ever. He speaks in detail about his storied career in this up-close and personal interview. Sept. 22: Buddy Colt talks about his incredible career on this week's Ringside Live. Buddy recounts how a chance meeting with Johnny Valentine encouraged he to turn pro. He tells about the time that Nick Gulas pulled a gun on him. He remembers turning heel and the old Oklahoma-Louisiana territory. He tells about starting a riot against Danny Hodge that led to stabbings. He tells how he came up with the ring name Buddy Colt and his incredible runs in Georgia and Florida. He details the vicious Georgia promotional war in the 70s. He gives his takes on the men he faces such as Cowboy Bill Watts, Jack Brisco, Lou Thesz, Mr. Wrestling II, Danny Hodge, Louis Tillet, Bobby Shane, Eddie Graham, and more. Sept. 20: A new video in the Wrestling Classics library. Check out the Legend of Buddy Colt. For a sneak preview, check out the video clips on the official Buddy Colt Web site. 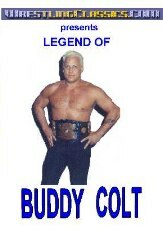 Sept. 17: Wrestling Classics is thrilled to add Buddy Colt to its family. Visit the official Buddy Colt Web site. talks about his incredible career on this week's Ringside Live. Buddy recounts how a chance meeting with Johnny Valentine encouraged he to turn pro. He tells about the time that Nick Gulas pulled a gun on him. He remembers turning heel and the old Oklahoma-Louisiana territory. He tells about starting a riot against Danny Hodge that led to stabbings. He tells how he came up with the ring name Buddy Colt and his incredible runs in Georgia and Florida. He details the vicious Georgia promotional war in the 70s. 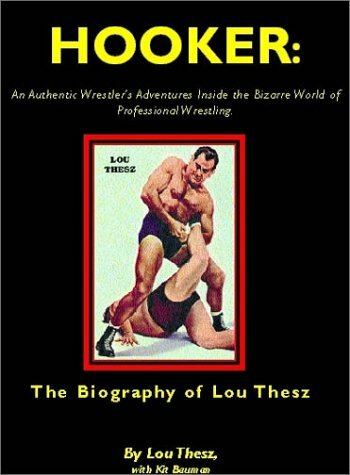 He gives his takes on the men he faces such as Cowboy Bill Watts, Jack Brisco, Lou Thesz, Mr. Wrestling II, Danny Hodge, Louis Tillet, Bobby Shane, Eddie Graham, and more. July 20: New free Video Clips in the Museum. Featuring the Jack Brisco Collection of the incredible Florida Tape 3 and more. May 7: A special multi-media tribute to the legendary Johnny Valentine. Hear 13 stars recount their memories of Johnny Valentine. Watch video clips of Johnny in action, and more. It's in the Features. The new edition of Pro Wrestling Title Histories is on sale now! Wrestling Title Histories is the most complete record of over 2,000 professional wrestling titles and titleholders ever published. If you want a complete guide of who the title holders were in your favorite territories, you must own this ultimate reference book. Contains information on titles from the WWF, WCW, ECW, NWA, Canada, Japan, Mexico, Britain, Australia, New Zealand, all the old territories -- Florida, Mid-Atlantic, San Francisco, Los Angeles, Detroit, Toronto, Dallas, Portland, Kansas City, St. Louis, Atlanta, Calgary, Memphis, Knoxville, Montreal, Puerto Rico, Mid-South, San Antonio and more -- as well as hundreds of independent promotions from across the U.S. (including now-defunct favorites like Smoky Mountain, the UWF, and the USWA). The new edition includes major title changes (WWF, WCW, ECW) right up to the end of 1999. If you are a new visitor to WrestlingClassics.com, browse Museum archives. This section displays short descriptive blurbs, photos and other items from professional wrestling history that have been previously showcased in WrestlingClassics.com's Museum's exhibits. If you�ve got an opinion about the state of pro wrestling today, or wonder what happened to the wrestlers who was your favorite when were a kid, register here & join us today. It�s absolutely FREE!